When you have a small team, running marketing campaigns is relatively smooth. The right hand always knows what the left hand is doing, communication comes easily and bottlenecks are few and far between. But as marketing teams grow, things can get rough (to say the least). As Director of Campaign Strategy at Unbounce, I’ve experienced this first-hand. The company has grown five times over since I started, and now, it’s not uncommon to have up to 20 people contributing to a single campaign. And while this significantly increases the potential of any campaign, it makes strong communication and process so much more important. With so many people involved, it’s dangerously easy to waste people’s time and create mediocre work that lacks a single vision. Below, I’m dissecting the process I use to create a campaign with a large team of people: the tools and processes that are critical for making sure everyone’s on the same page and has the information they need to make smart decisions. These are the elements that will help you run smooth and efficient marketing campaigns that bring the sort of results that will make your boss proud (or your client happy). Before anything else, it’s important to identify people’s roles in a campaign. Campaign ideas can come from anywhere. In my experience, the person who has the idea should be involved in the whole process, though they’re not necessarily doing much work, they’re accountable for the campaign’s success. If you hatched an idea and you’re not involved throughout, it’s like you had a baby, cared for it for a year, planned their life out in your mind, then put it up for adoption. It’s rare that the baby’s life will turn out just how you imagined. If you had just hired a nanny instead, you could explain the general idea, trust the nanny to make good decisions and watch your baby grow up and become the ESports celebrity you always dreamed of while you sit back drinking piña coladas and reaping the rewards of internet fame. …Anyway, along with the “Accountable” role, there are 4 other roles that play a part in a campaign’s success. Responsible Those who do the work. Could be one person or many. Accountable The one ultimately answerable for the item or completion of the deliverable. The one who delegates the work to those responsible. Sign off or approve work that “responsible” individual(s) provide as appropriate. Projects go most smoothly when a single person is accountable. Consulted Those whose opinions are sought, typically subject matter (or domain) experts; and with whom there is two-way communication. Informed Those who are kept up-to-date on progress, often only on completion of the task or deliverable; and with whom there is just one-way communication. Anyone whose work depends on this task. Without pre-defined roles, it’s unclear who is responsible for the success of the project. People tend to feel less accountable, and making a call about the success of the campaign becomes much more complicated when it’s muddled with all other types of efficiency problems. For every campaign, there’s usually “a thing” to be marketed. A new feature, an ebook, a partnership, whatever. When thinking about that thing, there are a few very important questions you’ll want to ask. Who does this solve a problem for? Alternatively, who does this present an opportunity for? Who are the types of people (buyer personas) the thing you’re marketing solves a problem for/presents a significant opportunity for? What is the specific problem you’re solving or opportunity you’re opening up for that person? Which pains that you’re easing are the most painful? Which opportunities are the most significant? Each one of the pains/opportunities you pick out for #5 represents its own campaign. If you have a ton of resources and the thing you’re marketing is monumental, you may choose to do many campaigns. If not, you may choose only the best one. You’ll need a campaign brief to communicate the goal, strategy and messaging of the campaign internally to the people you need help from (whether it’s stakeholders, specialists like your PPC or email person, or the creative department). If you’re all on a journey together, the brief’s the map. For each campaign you run, you should have an objective that every piece of that campaign is working toward. At Unbounce, almost all of our campaigns fall into one of those three metrics. Selecting a single objective is extremely important, because so many decisions will be based on trade-offs. For example, if you’re planning to write a specific content piece and your goal is branding, you’ll likely want write it as a series of blog articles and leverage SEO as much as possible. But if it’s a lead gen play, you may decide to format it in a PDF and collect email addresses before people can download the PDF. 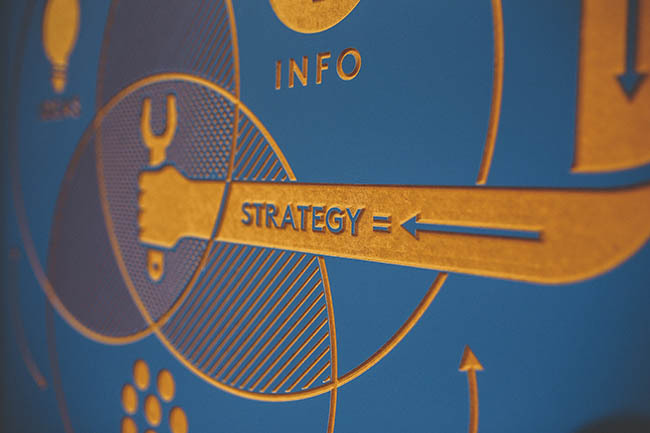 The word “strategy” has become a catch-all for a lot of things. Nobody seems to know exactly what it means anymore. I think of strategy as “the general idea of how you’re going to communicate the message to the target, then get them to carry out the objective.” It should be able to be summed up in a few sentences at most. Get to account strategists by targeting the companies they’re working for. Encourage the clients to tell their account strategists to tell their clients they need our newest feature. Ask our customers to reach out to all the account strategists they know and convince them to try our newest feature. Target account strategists broadly and get them to sign up for a free plan, where we’ll educate them until they upgrade. Target the most valuable account strategists in a very focused way that invites them to a one-on-one demo of the product and our new feature. Shower them with gifts so they love us. There’s no need to mention the specific way you’ll accomplish any of these things. It’s meant to be a general approach that you and your team can keep in mind while you’re deciding on the tactics you’ll employ and how to execute those tactics. If one person thinks we’re getting to account strategists through their clients and another thinks we’re just speaking to them directly, you’ve got a disaster on your hands. If your landing page is the hub of your campaign (and it should be), your tactics are your spokes. They’re how you’ll get the target of your campaign (the tire?) to complete the objective (the chain that attaches to the hub?) …I don’t know, this metaphor’s falling apart fast. Put simply, the tactics are simply a description of the ways you’ll use (or omit) the channels at your disposal to execute the strategy. Only when you’ve put in the mental effort to decide on your objective and your plan of attack (strategy) should you lock in your tactics. If either the objective or the strategy were to change, all your tactics should reflect that change. Run through all the channels I think should be used and if I have an opinion on how they should be used, I write it down. We’ve made a list of all the channels at our disposal and how they can be used. If you don’t have one, I highly recommend making one. When I get all those recommendations back, I challenge the person a little to make sure they’ve really thought it through, then when we’re both confident that their recommendation is the best way to drive people to our landing page, I add it to the brief. I then map out the entire plan on a whiteboard, identify all the points where a conversion will take place and consider ways that we could execute the tactics (or include additional tactics) in a delightful way that would catch the target off-guard and make them more likely to convert. This might happen solo, in collaboration with the Consulted or in a brainstorm. Congratulations, you’ve now figured out exactly how you’ll use everyone in your team to work toward a common goal. But wait… there’s more. Only when you’ve determined your tactics do you understand the scope of your project and the potential results. We estimate scope using a points system. Depending on the complexity of a campaign, we rate it 1, 2, 3, 5 or 8. We use the Fibonacci sequence because a campaign that’s HUGE in scope (8) would be much more work than a big campaign (5), not just 25% bigger. 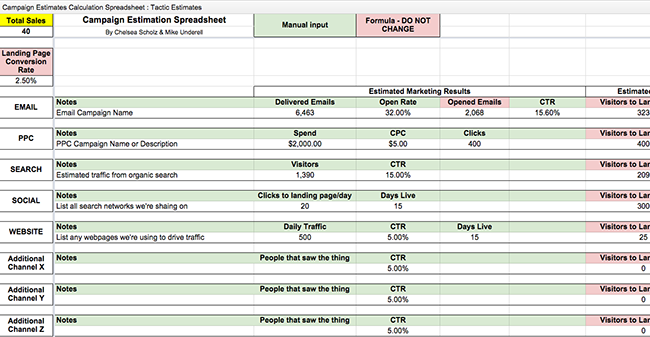 To estimate the results of a campaign, we plug all our tactics into a spreadsheet, identify all the points of conversion for each tactic on the way to the objective and estimate those conversion rates. The result should be the number of [the metric tied to your objective]’s you think you’ll get. Plug your final estimate into the “target” section of the brief. That estimate will come in handy at the end of the campaign when you need to decide whether to cut, optimize or double-down in the future. If you blow away your estimated results, double-down. An often-overlooked part of the process is pitching the idea back to those you need help from. If everyone leaves the meeting enthusiastic and invested in the journey they’re all embarking on, they’ll do better work. Then all you have to do is execute the damn thing! Pro tip: Present the plan to your stakeholders (who are usually your bosses) before this big meeting. If you come into the pitch with your head honchos backing you, you further reduce the chance of the meeting going sideways.